Another one of the main attractions in Rome is a visit to Vatican City. We stayed in a lovely BnB very close to the Vatican and so actually ended up there every day; the first time was just to pop by and have a look at St Peter's Square, the second was to see one of the Pope's addresses and the third was to go into the Vatican museums and St Peter's Basilica itself. 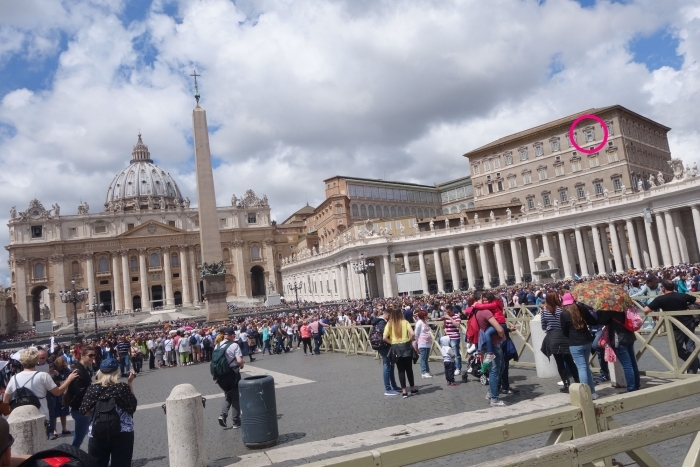 When the Pope is in Rome, there seems to be two possibilities to catch a glimpse of him. The first is at something called a Papal Audience which happens on Wednesday mornings. 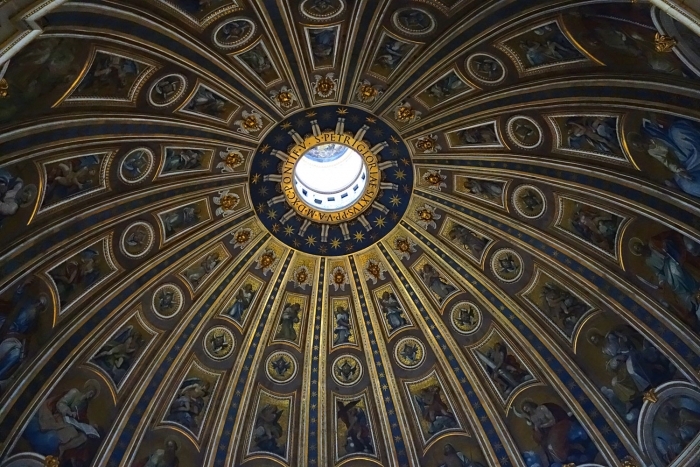 In the winter, the services are held in St Peter's Basilica and require a ticket which is free but needs to be booked in advance. In the warmer months, it is held in St Peter's Square where there is an area at the front with unreserved seating which again requires a ticket - but there is plenty of standing room in the Square itself if you can't get hold of one or weren't quite organised enough to get one before coming to Rome. It's worth remembering that the earlier you get there, the better the view you will have. As far as I am aware, this service lasts about 1-2 hours. 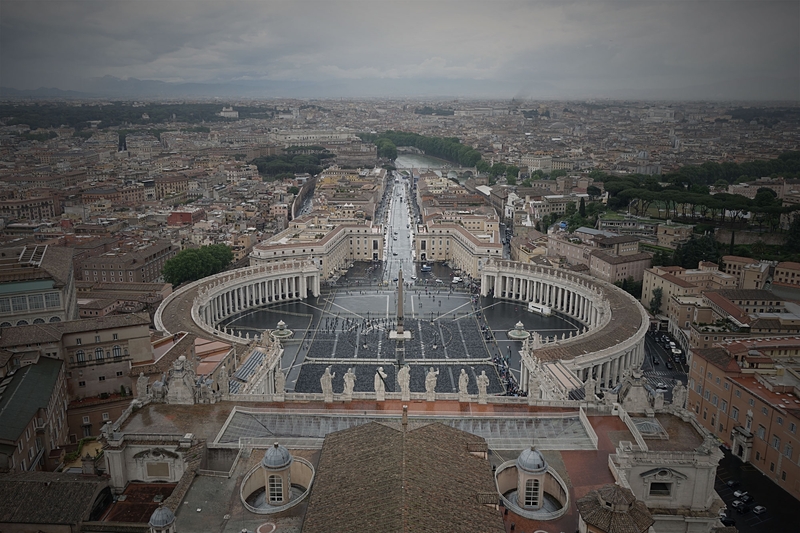 You can find more information about getting hold of tickets and when to pick them up on the Vatican Website. There is also a calendar on the website where you can see all of the Pope's appearances in advance and make sure he is actually there when you are visiting the city. There is plenty of standing space in the square. The second option is the Angelus. This occurs on a Sunday at midday if the Pope is in the city. 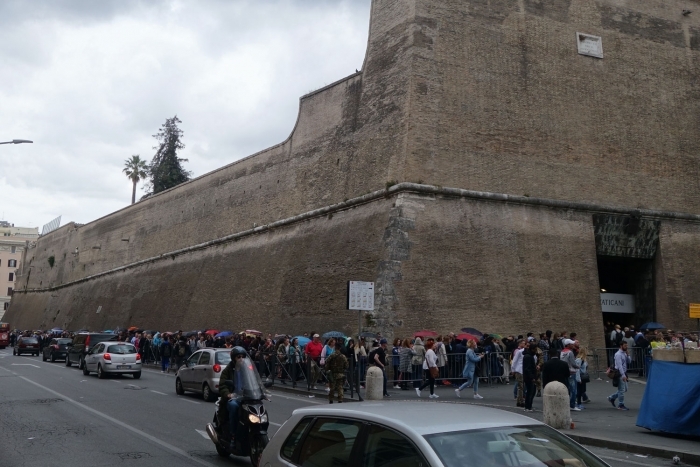 A ticket is not required for the Angelus and it is much shorter than the Papal Audience - only about 15-20 minutes long. 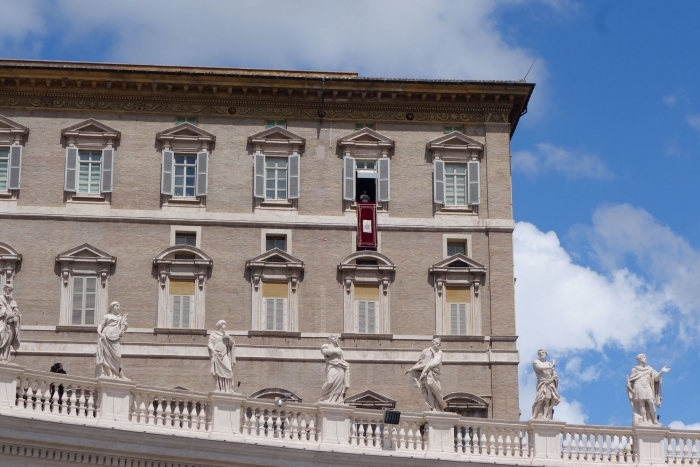 The Pope will appear from the window of his apartment and make a short speech followed by the Angelus. This was the option that we had available to us as we were visiting over a weekend and luckily for us, the Pope was in Rome on those dates. We didn't turn up to St Peter's square super early, probably around 10.30 - 10.45am. We followed the signs for the 'entrance to St Peter's Square' - ignoring all of the touts and ticket people along the way. 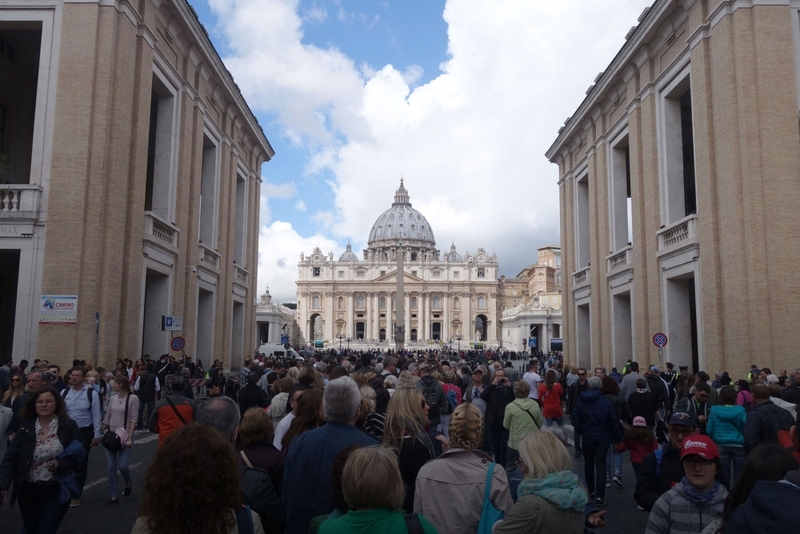 There were quite a few queues heading into square so we joined one and when we made it to the front - had our bags checked by Vatican police. The next step was trying to find out where the special window was so we could pick the best spot. In the end after some googling and working out where everyone else was looking we decided on a place to stand. It was actually a very fun and atmospheric wait - there were quite a few big groups near us and some started singing to pass the time! In case you are wondering what window the Pope talks from, it is in the building to the right of St Peter's Basilica. 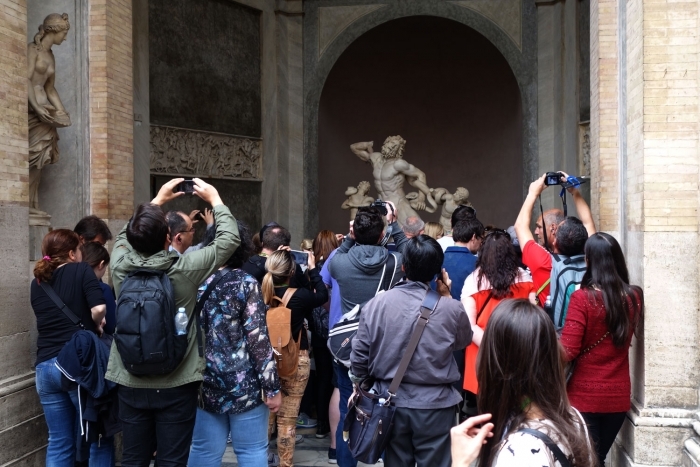 I mention this in our article about visiting the Colosseum but I would highly recommend booking your tickets for the Vatican museums and Sistine Chapel online before visiting. These can be bought here and at the time of writing were 16 euros per adult. It's worth mentioning that entrance is free every Sunday except for the last Sunday of the month but the closing time is much earlier and given the queues we saw on a normal day - I would imagine you would need to get there really really early to be in with a shot of even getting in. It's also worth checking on the Vatican Website that you aren't planning to attend on one of the random days that the museums are closed. As we had a ticket already we were able to walk past all of the people queuing along the outside of the walls and straight up to the main entrance. We only had to wait for about 10 minutes to get through a security check and then we were in! The museums were REALLY REALLY busy - essentially we were just following the flow of traffic and getting swept along in the sea of people. Finding the more popular bits of art is easy, although seeing them can be, at times, trickier. 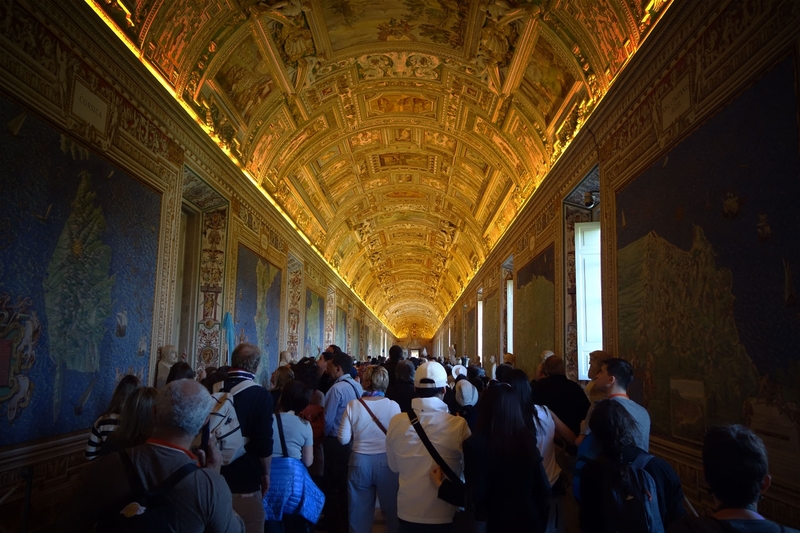 There is pretty much a set route that you can take to see the main sights and to get to the Sistine Chapel. 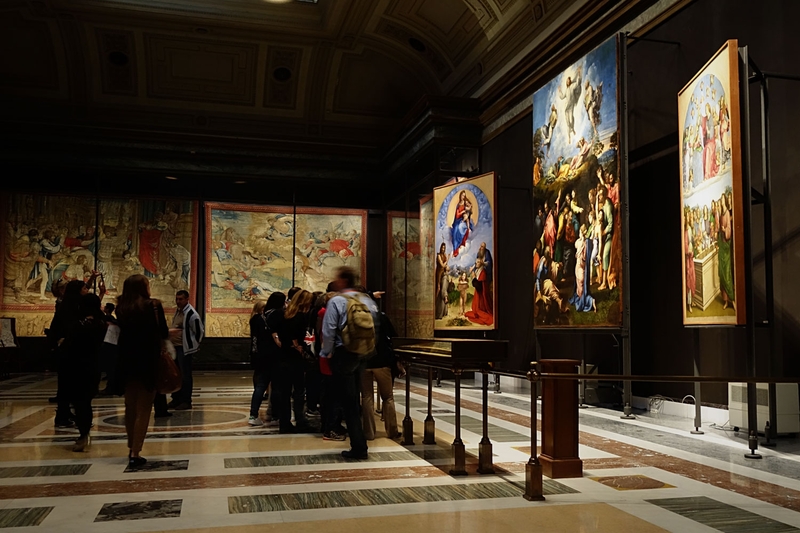 It's quite difficult to stop on the way and take in everything given the volume of bodies moving through each area but the architecture is still incredibly pretty and the artwork on display is quite magnificent. 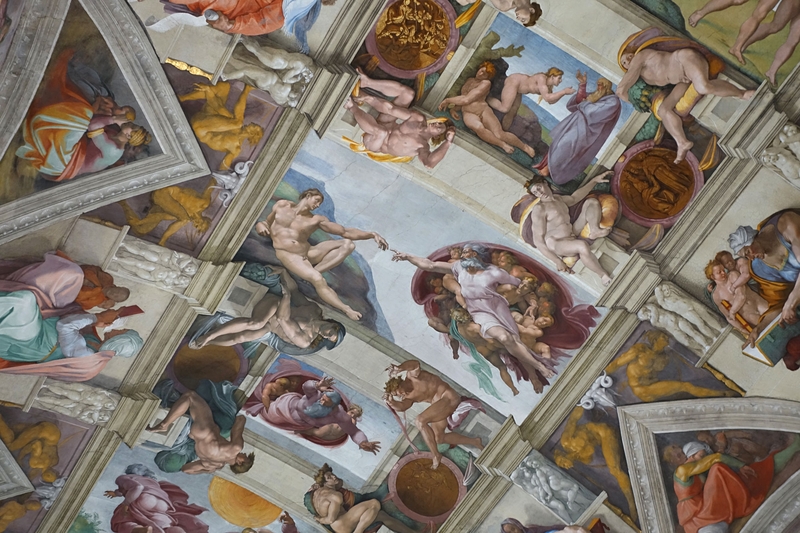 Again, the Sistine Chapel is unfortunately filled with people. It is definitely not as calm and serene as you may picture it. There is an opportunity to stop in the designated places (which the security guards will keep shouting for you to move into) and there are also some benches around the edge if you are lucky enough to grab one, which we were! Sneaky photo. Ssssh - don't tell the guards. Pictures are prohibited in the Chapel (again something which the guards will happily keep reminding you of). The Chapel itself is stunning however, despite the number of people in it. It was amazing to just sit and admire the ceiling. 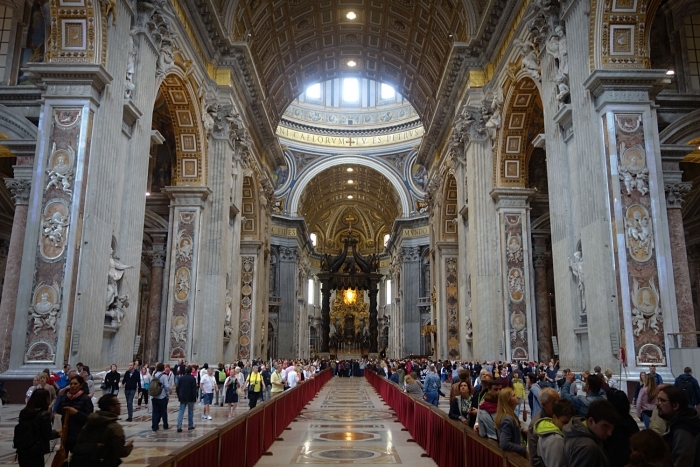 St Peter's Basilica is actually free to visit and is separate from the other Vatican Museums and Sistine Chapel. The entrance is sign-posted from St Peter's Square and it was probably the longest of the queues we had during our time in Vatican City. Part of the queue unfortunately went outside and it started to rain so were lucky we had our umbrellas with us. Inside St Peter's you can wander around at will, admiring the architecture, art and sculptures. There were also some confession booths for different languages and private areas for prayer. We went down to see the papal tombs as well which although slightly creepy was really interesting! Alistair managed to convince me to take a trip up the dome whilst we were there...I don't really know why I agreed, given my crippling fear of heights but I thought I would be OK. It costs 5 euros per adult to take the stairs the whole way up or 7 euros per adult to get an elevator to the first part. The entrance is signposted from the St Peter's so you will easily find it. We elected to take the lift which takes you up to the inner dome viewing area. 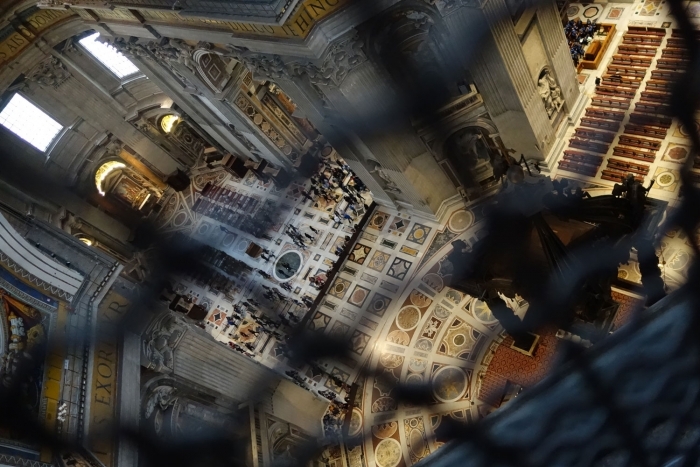 You can walk around a balcony which looks down onto the people in the main building below and get a closer look at the inner dome. From this point, it is stairs all the way to the top! 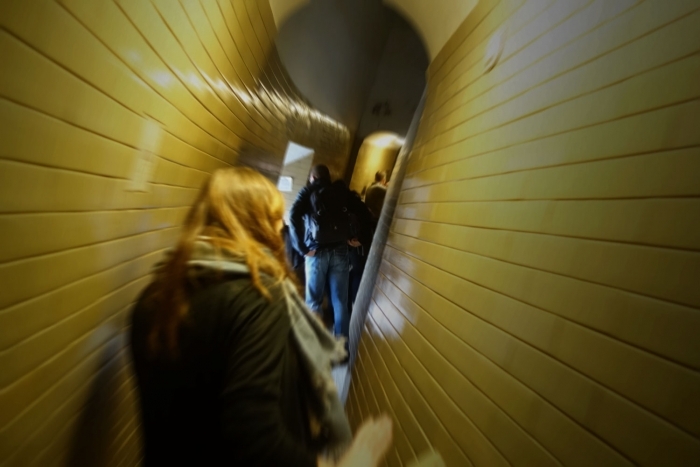 It was these stairs that freaked me out - they are very narrow and actually follow the shape of the dome (so have slopping walls). There is no option to stop or turn around as there are people ahead and behind you so unless there is an emergency - you need to keep going. If you suffer from claustrophobia, it is not a good idea to do this! Also - there are actually A LOT of steps so if you struggle with stairs, its maybe not worth trying to go up either. At the top, the views were awesome over the whole of Rome (but still pretty terrifying if you have a fear of heights) and I will say that the journey down (which was a different set of steps) was a whole lot easier than the way up and we were able to take the lift down the final portion thankfully. All in all there is a ton of stuff to do at the Vatican, so make sure you plan ahead and know what you want to try to fit in and as I said above - try to book your tickets in advance for the museums - it'll save you a whole lot of time in the long run!